Situated in Belhaven, Scotland, the Belhaven Brewing Company has been brewing beer since back in 1719. They held out as an independent company all the way until 2005, at which point they were acquired by Greene King. Until that takeover, they were the oldest and largest independent brewery in Scotland. While it's sad they had to sell, 286 years was a pretty damn good run. Malty and hoppy. [...] Delivering a sweet, smooth and creamy finish, Scottish Ale has a stunning ruby colour in the glass. Magic. It's certainly not a magical description, but it's what's insides the can that counts. Let's activate the widget and jump in. Appearance: A crystal-clear, orange-brown body capped by two amazingly solid fingers of creamy head that endure until the bottom of the glass and leave great lacing all the way down. Aroma: Spicy, earthy hops and assorted fruit over toasty malt with some mineral notes. It's all muted a little by the dense head. Taste: Essentially what's promised in the nose, but with the intensity ratcheted up a notch. Earthy hops and fruit (banana and apricot) over a backbone of sweet, lightly toasted malt. There's some nuttiness and a hint of smokiness added in, giving it a little more character. The aftertaste is fruity with toasty malt. Mouthfeel: Medium bodied and highly creamy with typically smooth nitro bubbles. Dries in the finish. Drinkability: An easy-drinking brew that makes for a great session choice. 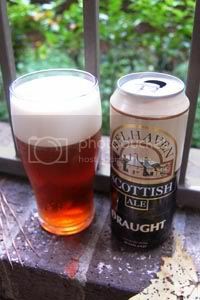 Verdict: Straightforward, yet tasty, and nicely sessionable, Belhaven is a great example of the lower-alcohol style of Scottish Ale. If you're a fan of nitro creaminess and you're looking for a new quaffable new brew, this is a great choice.